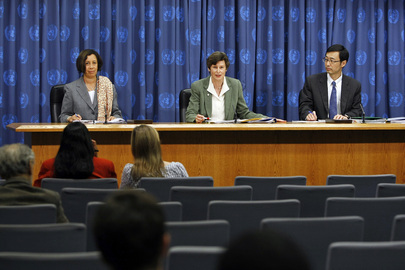 UNITED NATIONS, May 1 -- One of the UN's few mechanisms against favoritism, its National Competitive Exam, has quietly been "suspended," Inner City Press has learned. The UN's website states that "the National Competitive Exam (NCE) aims to improve geographic diversity amongst staff, which is essential for a truly diverse international civil service and is also very important to Member States." Earlier this year, Inner City Press was shown an e-mail sent out by a senior official in the UN's Office of Human Resources Management, headed by Catherine Pollard, that NCE is being scrapped. UN is not scrapping the National Competitive examinations. We have temporarily suspended these exams for revamping to make them more efficient. Many have asked, why suspend the exam "for revamping" -- why not just design whatever improved system is ostensibly desired while continuing with the existing exam, through which applicants from under-represented countries can compete to work for the UN? Others say that one of the other few UN merit pathways, the G to P test, is also being suspended. These people guess that neither will return in positive form. Some Missions are said to be angry, as they learn of this anti-reform. Watch this site. Footnote: so many Department of Management issues have arisen -- unlicensed dispensing of controlled narcotics in the Medical Services, asbestos controversies in the Capital Master Plan, failure to discipline in Nairobi and DESA, procurement irregularities -- that it seems time for a press conference by Angela Kane. Other say that a meeting was held at the U.S. Mission to "get the top DM post back." We'll see.